Did you know that there is an animal similar to the kangaroo but the size of a mouse? Did you know that there is a bat no bigger than a bumblebee? Did you know that there is an animal called an elephant shrew that is neither an elephant nor a shrew? Well, these animals exist... but maybe not for long. They're all extremely rare and endangered. This book introduces the EDGE (Environmentally Distinct & Globally Endangered) program and the work its scientists do. The authors present eleven different animals and explain how scientists are studying them or trying to find them. Each brief spread is laid out like a magazine page, making this book great for browsing. The book includes tons of color photographs and side boxes with fun facts and interesting information. It seems like every year we get kids in the library doing an endangered species report and some of them are researching animals so very rare that there is very little information about them. Although the information in this book is a bit scant for research purposes (most animals only get three or four paragraphs), this might be a source for those extremely rare animals that you can't find in any other books. 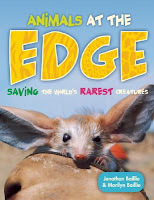 Animals at the Edge includes the following animals: Attenborough's long-beaked echidna, Yangtze river dolphin, Hispaniolan solenodon, long-eared jerboa, bumblebee bat, pygmy hippopotamus, slender loris, Hirola antelope, golden-rumped elephant shrew, aye-aye, and wild Bactrian camel. I heard about Animals at the Edge through a review on The Well-Read Child, which you'll want to check out. Jill's great review made me want to read it! You might also want to check out the EDGE website for more information about the program. Happy Nonfiction Monday! Anastasia's got the roundup at Picture Book of the Day. Just the kind of book I needed over and over again as a classroom teacher and librarian! This is one my youngest son will enjoy -- me, too. Hmmmm... there's probably a great picture book idea in there. ;) Thanks!